Arising from the Supreme Court judgement that affirmed Mr Ejike Oguebego as the Anambra State Chairman of the Peoples Democratic Party (PDP), senatorial candidates of the pro-Oguebego faction are asking INEC to issue them certificates of return. 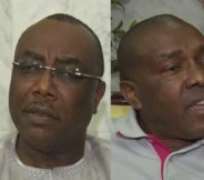 Both Mr Chris Uba and the other two senatorial candidates on the list submitted to INEC as candidates to the election are asking the electoral umpire to issue them certificates of return. 'INEC should do the needful next week, we cannot waste any more time. My lawyers are not wasting time. I can personally go there and demand my certificate because it is my right,' said the Anambra North Senatorial Candidate, John Emeka. The Anambra Central Senatorial Candidate, Mr Annie Okonkwo, explained why they believe they are the authentic candidates of the party, recognized by the party exco in the state. 'The party submitted our names, INEC published these names. The deadline of substitution had passed; you cannot change or remove any candidate and there was no death. 'INEC already finished what they were supposed to do, then our names were removed few days to the election after we had finished campaigning for the elections,' he stated. This request is coming at a time when senators already representing the state insist that the apex court judgement had nothing to do with them. Senator Andy Uba had said in an earlier interview with Channels Television that the primary election for senatorial candidates of the PDP in Anambra State was conducted at the national level and not by the state exco. Therefore, he remains the Senator representing Anambra South in the Senate. Former Aviation Minister, Stella Oduah, also debunked reports that the Supreme Court has nullified her election into the Senate based on interpretations of the Supreme Court ruling. There had been reports earlier on Friday that the Supreme Court had sacked the two Senators from Anambra State nearly two months after a third Senator from the state, Uche Ekwunife, was sacked. Oduah said, 'In all its entirety, it is false. I have gone through the court judgment and the judge clearly did not give any judgement to that effect. 'Indeed, what the judgment and the case is all about is state exco and as we all know, state exco do not do election, neither do they submit list. 'So the issue of emergence of candidate, and the issue of candidates that won election was not the issue of this particular case.' - Channels.